The 6th annual Privacy Camp takes place just before the start of the Computers, Privacy and Data Protection (CPDP) 2018 conference. Privacy Camp brings together civil society, policy-makers and academia to discuss existing and looming problems for human rights in the digital environment. In the face of a “shrinking civic space” for collective action, the event aims to provide a platform for actors from across these domains to discuss and develop shared principles to address key challenges for digital rights and freedoms of individuals. The theme this year is “speech, settings and [in]security by design”. The event features two main tracks. The first will discuss the challenges to freedom of speech online and the potential of a digital public sphere and the second track will focus on the security of devices and infrastructure. Altogether, these two tracks will explore whether we can collectively design better data infrastructures and information architecture. 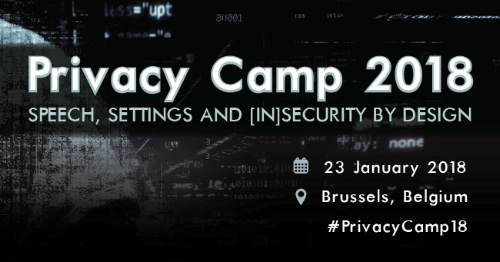 This year, Privacy Camp will also feature the “civil society summit” of the European Data Protection Supervisor (EDPS) with opening remarks by Giovanni Buttarelli. Co-organised by European Digital Rights (EDRi), Privacy Salon, USL-B Institute for European Studies and VUB-LSTS. Roundtable "Cross-border data transfers: Effective protection and government access, in particular in the transatlantic context"